Go to original pattern for design DROPS Extra 0-1256. Knitted DROPS shawl with worked diagonally with tips and stripes "Delight" and "Kid-Silk". Measurements: Width at top: approx. 170 cm. Height: approx. 65 cm. 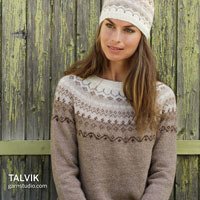 You can get the yarn to make this pattern from	18.30£. Read more. See diagram A.1. Repeat these 16 rows upwards. 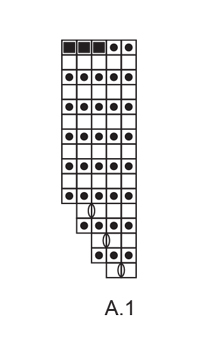 The diagram shows all rows in pattern seen from RS. * K 2 rows with Kid-Silk, K 2 rows with Delight *, repeat from *-* until finished measurements. Inc 1 st by making 1 YO, on next row K YO twisted (i.e. work in the back loop of st instead front) to avoid holes. Worked back and forth on circular needle to make room for all the sts. Work from tip and diagonally in GARTER ST - see explanation above. 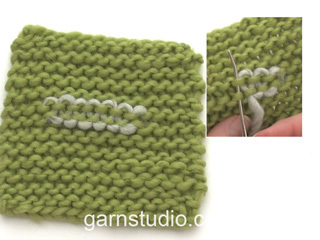 Cast on 4 sts on circular needle size 5 mm with Delight. ROW 1 (= WS): K all sts. ROW 2 (= RS): K 1, 1 YO, K 2, insert 1 marker before next st and move it upwards when working, 1 YO, K 1 = 6 sts. READ INCREASE TIP. NOTE: On next row switch to Kid-Silk - READ STRIPES. Then work as follows, beg from RS: K until marker, finish with A.1 - READ PATTERN - AT THE SAME TIME inc 1 st inside 1 edge st at beg of row from RS (first inc beg on 6th row), repeat inc every 4th row (= every row with Delight). 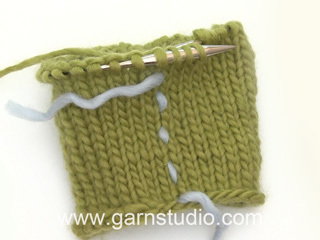 REMEMBER THE KNITTING TENSION Continue like this until piece measures approx. 135 cm along marker - adjust after last row in A.1. Then work as follows: Continue inc at beg of row from RS as before - AT THE SAME TIME cast off for tips as follows: Cast off 6 sts at beg of row from WS (first cast off beg on 8th row after diagram A.1 is finished), repeat this cast off every 8th row. Continue like this until all sts have been cast off, fasten the yarn. Im Muster A1 ist je 1 Zunahme in Reihe 1, 3 und 6. Müssen noch weitere Zunahmen gearbeitet werden? Es heißt: Gleichzeitig neben der Randmasche (davor?) am (wo?) der Hin-R. zunehmen. Dies ist nicht eingezeichnet und sehr verwirrend. Liebe Laura, in A.1 werden nur die 3 angezeigten Maschen zugenommen. Viel Spaß beim stricken! Hello! Could you please advise the correct way to cast off 3 stitches in row 16 of diagram A.1? Maybe you can provide a link to the appropriate tutorial video? 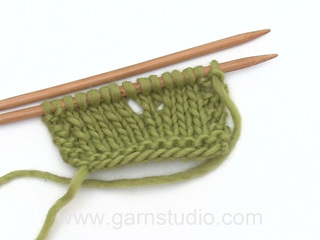 After I do this cast off I get a noticeable hole in my knitting, and the next stitch gets very loose and makes a smaller hole next to the 1st one. I do not think this is correct, as I do not see any holes on the picture in the pattern. Thank you! Dear Elena, on the 16th row in A.1 you are casting off the first 3 sts from WS (1 st remain on needle) and Knit next st = there are 5 sts left in A.1. 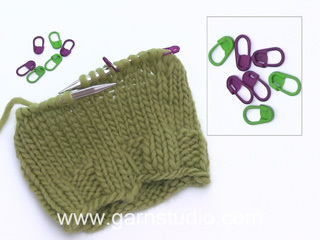 See video how to cast off with knit sts. Happy knitting! Referente a este patrón, no está muy claro como se confecciona (o al menos yo no lo he comprendido bien) Yo entiendo que se comienza por un lado aumentando un punto en la parte derecha de la labor, y luego después del centro se quitan 4 puntos. En la imagen se ve que hay un escalón de 4 punto eso es así? Hola Ana, se comienza con 4 puntos y se aumenta solo en un lado (al principio de la fila por el lado derecho). A partir de la mitad de la espalda,continuamos aumentando como antes por el lado derecho y al mismo tiempo cerrar 6 puntos al principio de la fila por el lado revés. Repetir las disminuciones según el patrón.